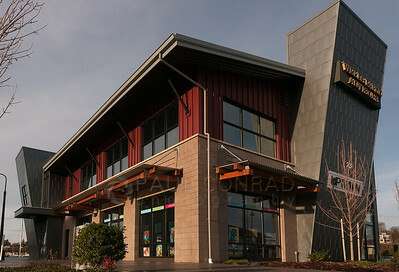 © Paul Conrad/The Bellingham Herald - Senior Instructor Amy Hill teaches a class at Uptown Art on Bellwether Way in Bellingham, Wash., on Friday afternoon December 5, 2014. 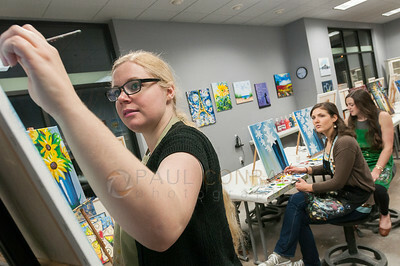 © Paul Conrad/The Bellingham Herald - Senior instructor Amy Hill of Bellingham, Wash., demonstrates a brush stroke technique while teaching a class at Uptown Art painting studio on Bellwether Way in Bellingham, on Friday evening December 5, 2014. 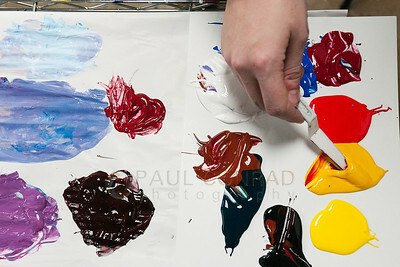 © Paul Conrad/The Bellingham Herald - Katie Denson of Bellingham loads her palette with fresh paint during a class break at Uptown Art painting studio on Bellwether Way in Bellingham, Wash., on Friday afternoon December 5, 2014. 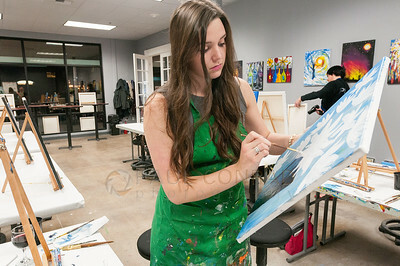 © Paul Conrad/The Bellingham Herald - Kelsey Potter of Bellingham, Wash., touches up her work while taking a class at Uptown Art painting studio on Bellwether Way in Bellingham, Wash., on Friday afternoon December 5, 2014. 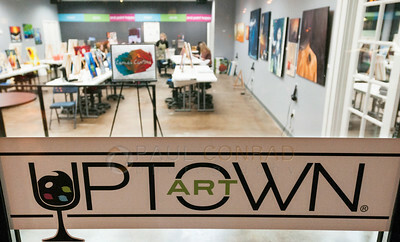 Potter says she has been painting since high school but this was her first time at Uptown Art. 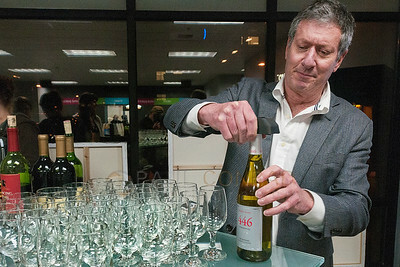 © Paul Conrad/The Bellingham Herald - Studio owner Robert Mishkin opens a bottle of wine for guests prior to class beginning at Uptown Art on Bellwether Way in Bellingham, Wash., on Friday afternoon December 5, 2014. 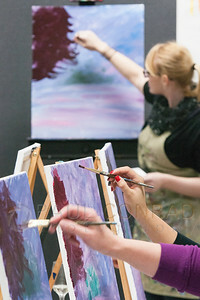 © Paul Conrad/The Bellingham Herald - Class participants work on their projects as senior instructor Amy Hill demonstrates brush technique at Uptown Art painting studio on Bellwether Way in Bellingham, Wash., on Friday afternoon December 5, 2014. 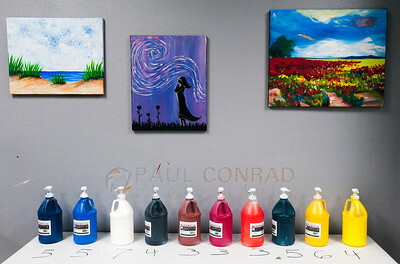 © Paul Conrad/The Bellingham Herald - Paints lined up under paintings at Uptown Art painting studio on Bellwether Way in Bellingham, Wash., on Friday afternoon December 5, 2014. The numbers indicate how many pumps of each color are necessary to begin the designated project. 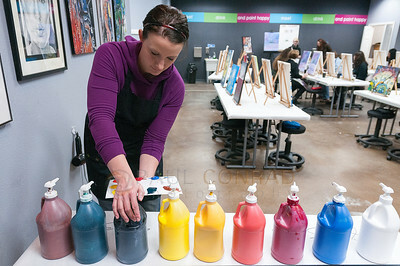 © Paul Conrad/The Bellingham Herald - Senior instructor Amy Hill mixes her colors while teaching class at Uptown Art painting studio on Bellwether Way in Bellingham, Wash., on Friday afternoon December 5, 2014. © Paul Conrad/The Bellingham Herald - Senior instructor Amy Hill, left, of Bellingham, helps student Casey Shipley of Ferndale, complete her work at Uptown Art painting studio on Bellwether Way in Bellingham, Wash., on Friday afternoon December 5, 2014. 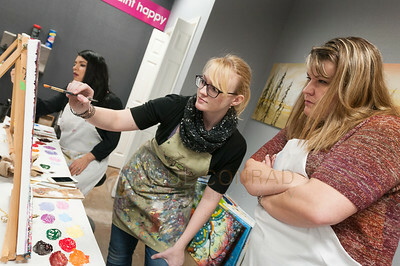 Shipley says this is her first time painting and visiting Uptown Art. 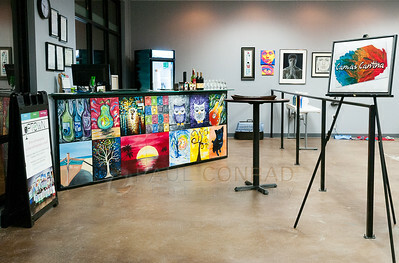 © Paul Conrad/The Bellingham Herald - Wine, beer, water and other drinks are available for students at the Canvas Cantina in the entrance of Uptown Art painting studio on Bellwether Way in Bellingham, Wash., on Friday afternoon December 5, 2014. Don't Get the Two Mixed Up! 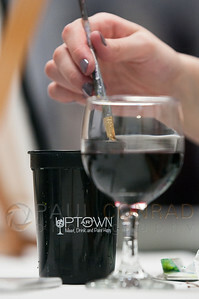 © Paul Conrad/The Bellingham Herald - Kelsey Potter wets her brush during class at Uptown Art painting studio on Bellwether Way in Bellingham, Wash., on Friday afternoon December 5, 2014. 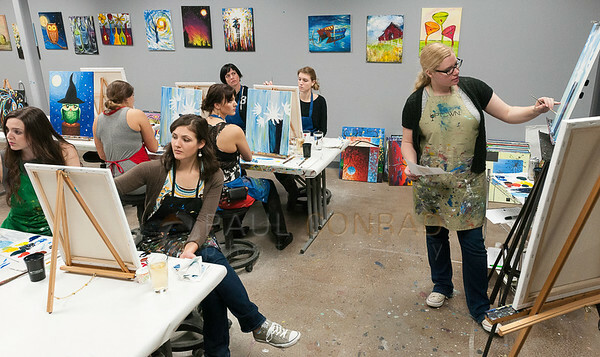 © Paul Conrad/The Bellingham Herald - Instructor Caitlyn Christianson, left, demonstrates brush technique as particpants Ashleigh Pollard, center, and Kelsey Potter observe at Uptown Art painting studio on Bellwether Way in Bellingham, Wash., on Friday afternoon December 5, 2014. 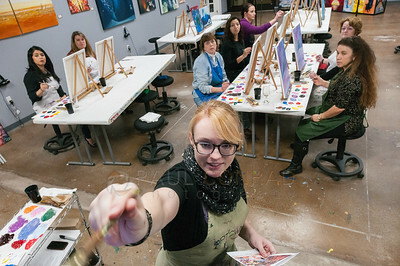 © Paul Conrad/The Bellingham Herald - Instructor Caitlyn Christianson, right, leads class at Uptown Art painting studio on Bellwether Way in Bellingham, Wash., on Friday afternoon December 5, 2014. 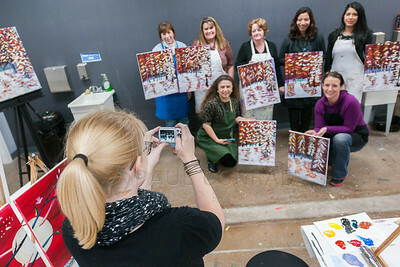 © Paul Conrad/The Bellingham Herald - Senior art instructor Amy Hill, of Bellingham, Wash., takes a photo of her students with their completed work at Uptown Art painting studio on Bellwether Way in Bellingham on Friday afternoon December 5, 2014. © Paul Conrad/The Bellingham Herald - Images from Uptown Art painting studio on Bellwether Way in Bellingham, Wash., on Sunday afternoon December 7, 2014.